The most recent edition of OSU Agronomy’s C.O.R.N. newsletter published by my Extension colleagues gave the September and October weather predictions that will impact harvest of agronomic crops. 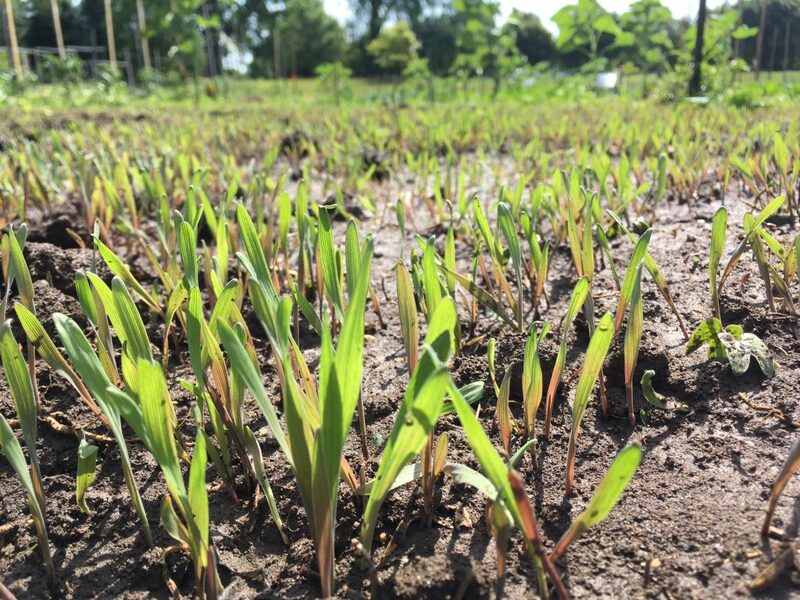 The backyard grower, community gardener, and urban farmer can use this data to make plans for season extended plantings by applying frost dates and predicted temperatures and rainfall amounts into the planting schedule. What does this mean for plantings? Make sure to keep row cover or other season extension fabric on hand and monitor overnight temperatures carefully as we reach the October 10th – 20th time period to allow maturity and harvest of summer plantings of green beans or zucchini. General above average temperatures should allow for harvest into fall of late summer plantings if protected as needed. Watch for frost or freeze events to plan harvest of sweet potatoes prior to overnight cold temperatures which may damage tubers and decrease storage life. Timing of over wintered spinach plantings should target early to mid-October for completion. El Nino winters in central Ohio average warmer than normal temperatures with less than normal snowfall. Current the National Weather Service has an El Nino Watch in place. Winter – 70% chance of El Nino formation in winter. Many backyard growers, community gardeners and urban farmers rely on pollinators as crucial members of their food production systems. Right now is when Monarch Butterflies are in the chrysalis period with an upcoming trip to Mexico. This was shot on location at The Children’s Garden at the Hocking County Fairgrounds over the course of 2017 from beginning of the process through the migration period as a way to educate students about pollinators. 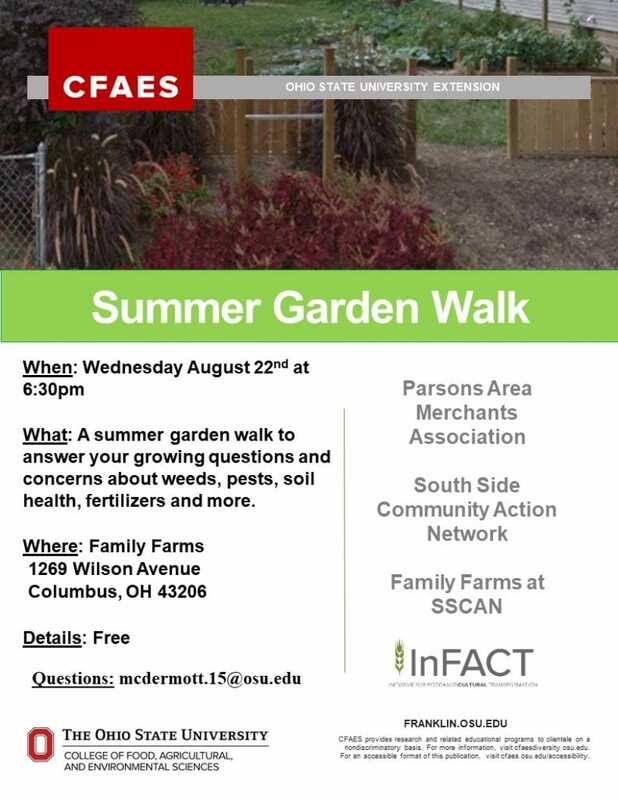 In collaboration with Hocking Soil and Water Conservation District. Container Gardening Class at The Linden Farmer’s Market on Sunday August 26th @ 2 pm. 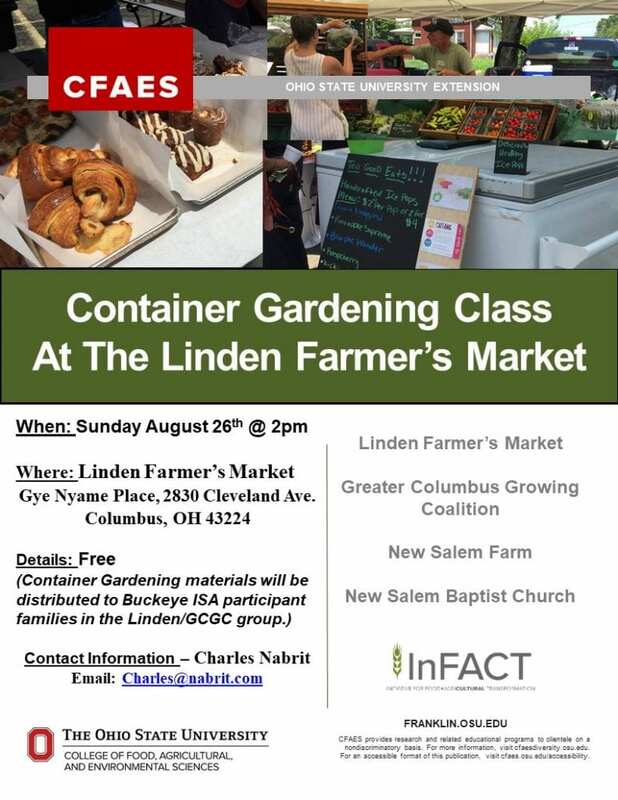 There will be a Container Gardening Class held at The Linden Farmer’s Market at 2 pm on Sunday August 26th. 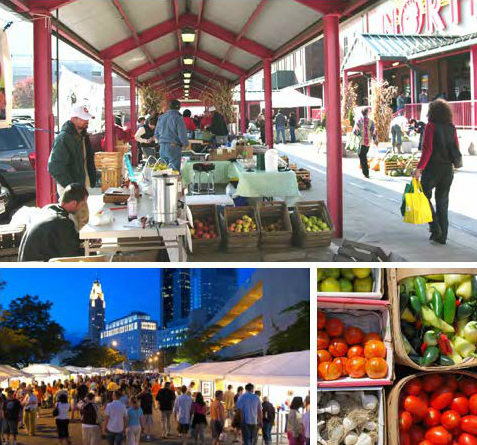 The market is located at Gye Nyame Place, 2830 Cleveland Avenue, Columbus, OH 43224 and runs from 1 – 4 pm. Come on out to take a class, browse the market, see the vendors, and purchase some delicious fresh local produce, baked goods and homemade treats. 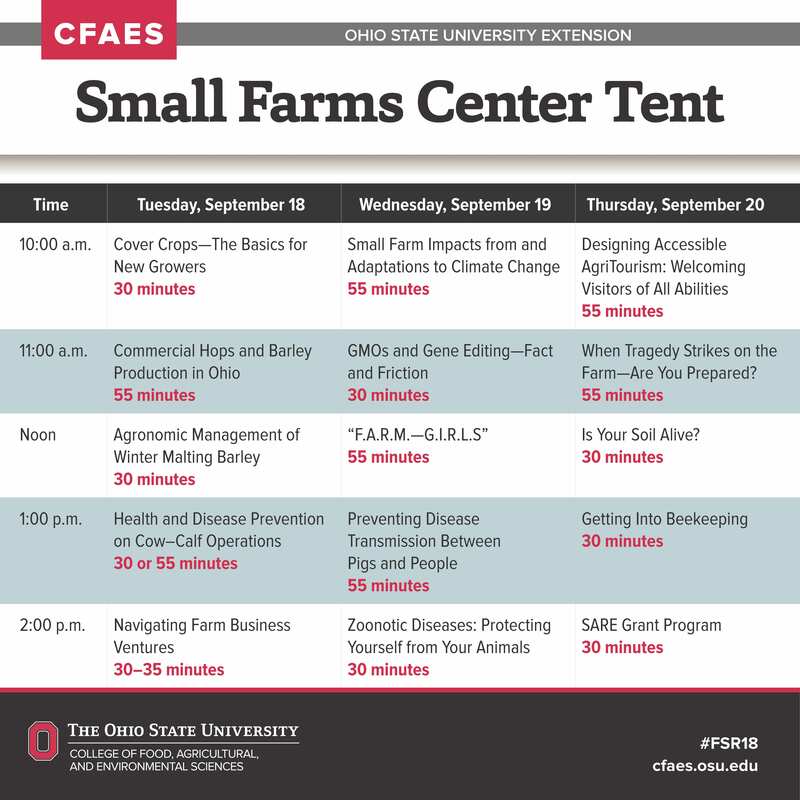 The 56th annual Farm Science Review is only about a month away. There are many activities, events, educational presentations and displays over the three days of activity that the backyard grower, community gardener and urban farmer can use in their production. 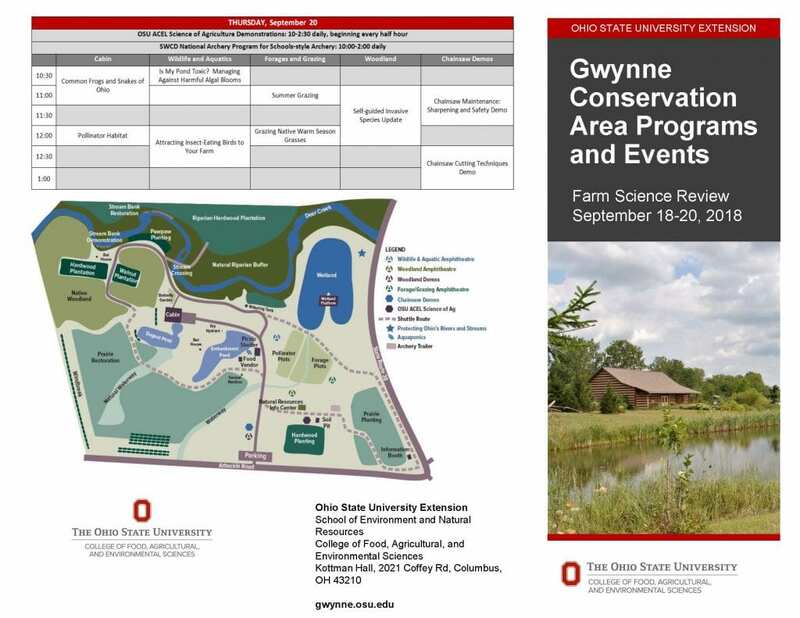 Below are the activities at the Small Farms Area as well as across Arbuckle at The Gwynne Conservation Center. 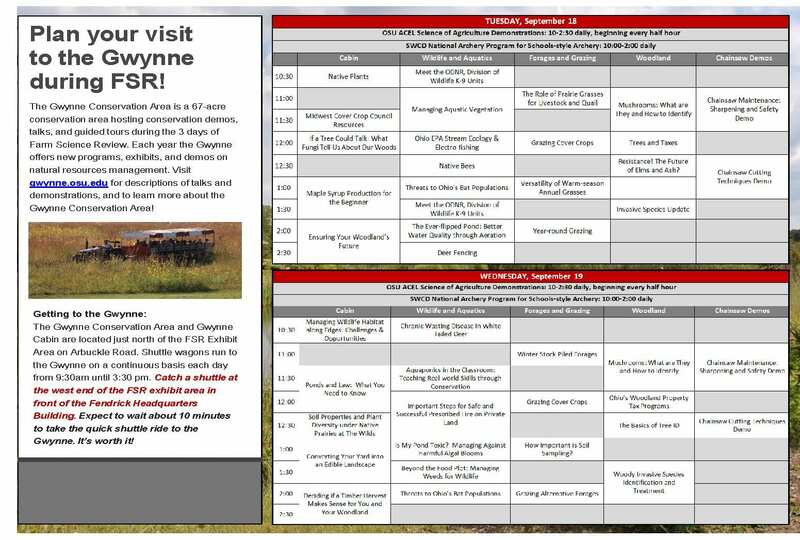 Both educational programs are included in admission including a tractor ride over to The Gwynne. The Gwynne Conservation area is a short shuttle down the road from the main site. This natural area has educational programming with workshops in multiple locations as well as food sales and restrooms. Shuttles run all day long of the review each day to take patrons back and forth to both locations. Tickets may be purchased in advance for $7 dollars at The Franklin County Extension office or may be purchased online in advance at THIS LINK. Tickets purchased at the gate are $10 dollars. The one and three month temperature and precipitation projections for weather in central Ohio call for increased chances of above average temperatures and near normal precipitation. This is favorable for maturation of vegetables planted to take advantage of the fall growing season. The fall vegetable timeline indicates that right now is a good time to plant another round of multiple vegetables including cucumbers, zucchini, green beans, peas and potatoes. Keep in mind when planting potatoes, the flowering occurs before formation of the potatoes under the ground. This means that if the weather turns colder at night and the producer wishes to prevent frost damage to the leaves, a row cover can be applied without worry about inhibiting pollinators. I gave an update on the ENSO/El Nino phenomenon last month in Growing Franklin. An update was posted on NOAA/NWS recently that has upgraded the chances for fall to 65% and for winter to 70%. El Nino winters in central Ohio have an increased chance of warmer weather. This is important for planning for over wintered vegetables under season extension as well as timing of cover crop plantings. Season Extension methods can be used in summer as well as to protect plantings from cold in cooler months. CLICK HERE for a link to Using Shade Fabric for Summer Season Extension of Cold Weather Crops. 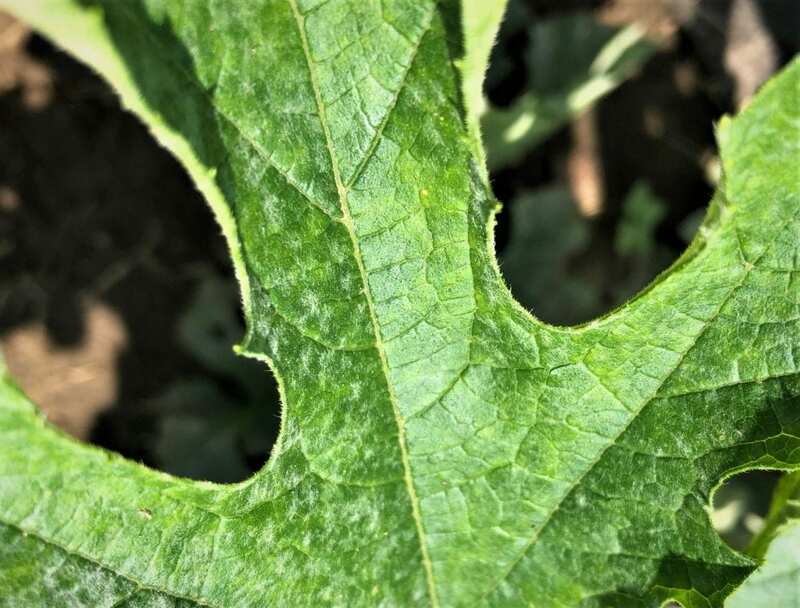 Multiple problems have been reported by central Ohio growers regarding cucurbit family crops, specifically summer squash and cucumbers. 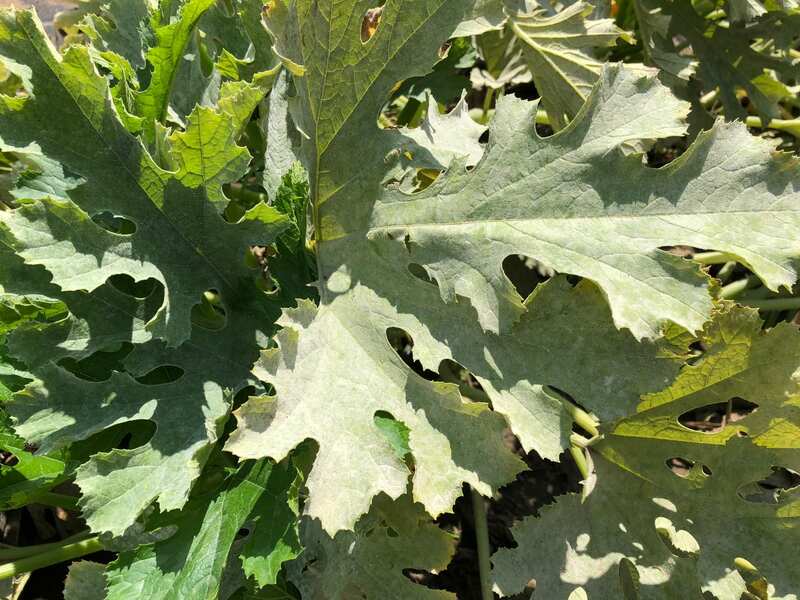 Powdery mildew has become widespread in the area recently, showing up as white patches on the cucurbit leaves. These patches can eventually cover the entire leaf surface. They are not generally fatal to the plant, but can kill the leaves, weaken the plant, and decrease plant productivity. CLICK Here for OSU Veggie Disease LINK for Powdery Mildew on Cucurbits. 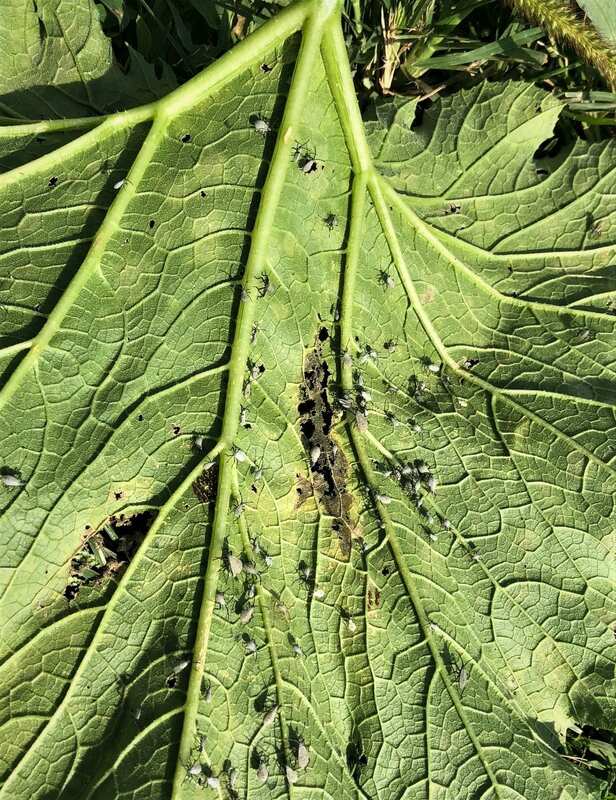 Another problem noted in cucurbits is squash bug nymphs are hatching from egg clusters laid recently and are approaching infestation levels on many plantings. The adult was disturbed in the act of laying these eggs prior to the picture being taken. Eggs darken in color after being laid. Do not let large numbers of squash bugs reach infestation levels trying to ripen a last, small amount of cucumbers or zucchini. 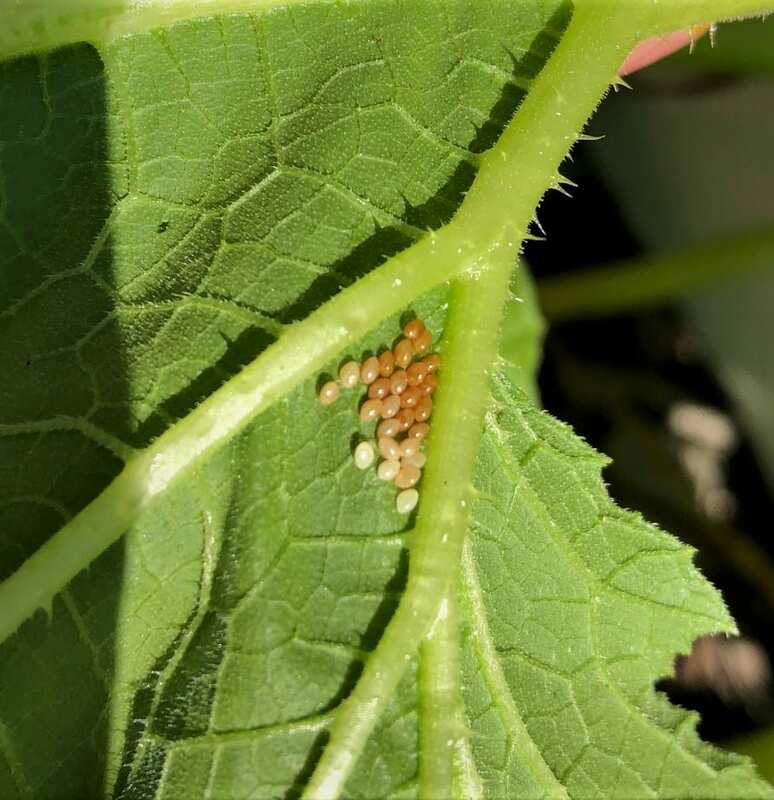 Eliminating the infested plantings, not composting, can remove large amounts of squash bugs now to decrease the burden faced by fall planted cucurbits. Take care to factor in impacts to pollinators if pesticides are being considered for control. 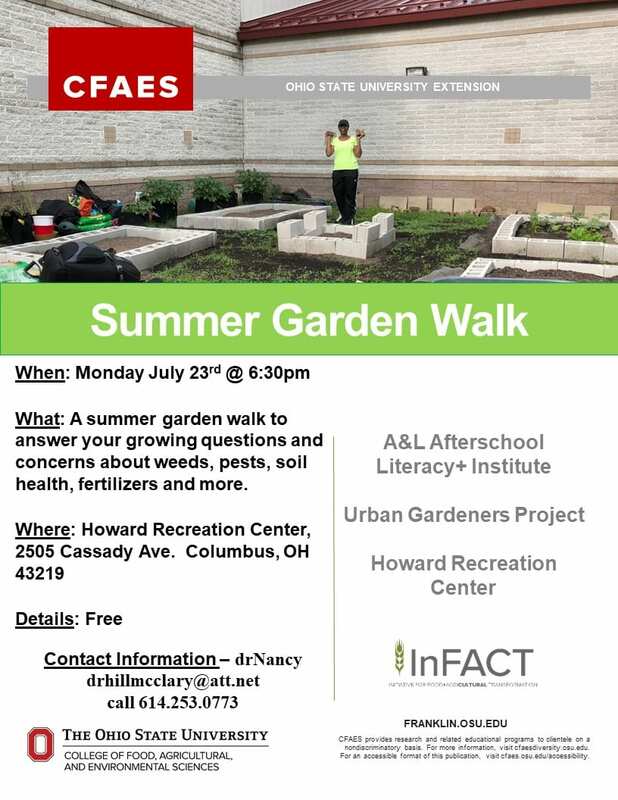 There will be a summer garden walk at the community garden behind Howard Rec Center on Monday July 23rd at 6:30 pm. 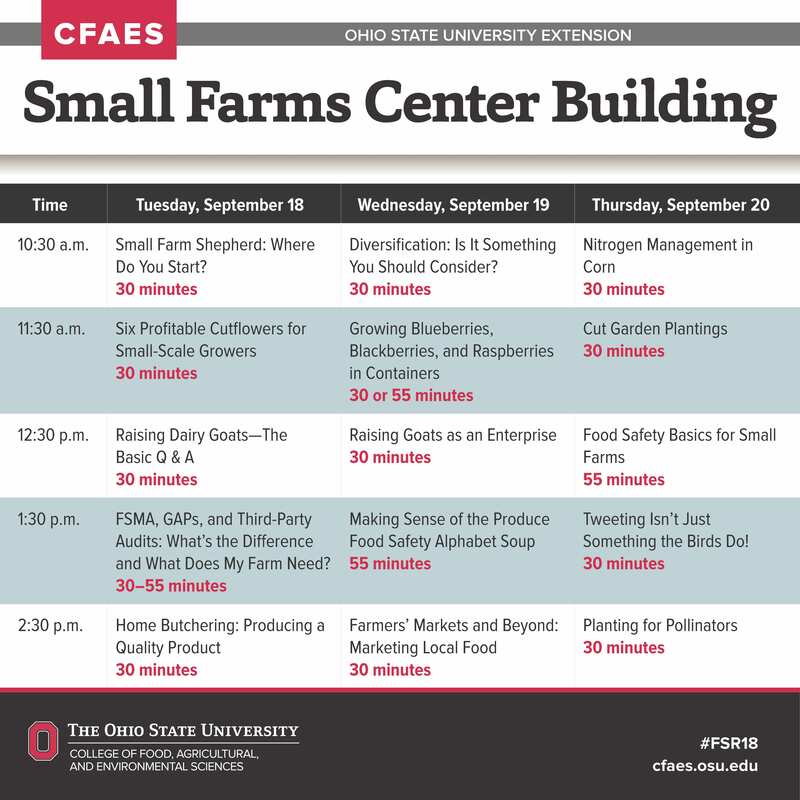 Come to see what is growing and discuss concerns about pests, weeds, diseases, varietal selection, fall planting, soil health and more. The event is free and open to the public. 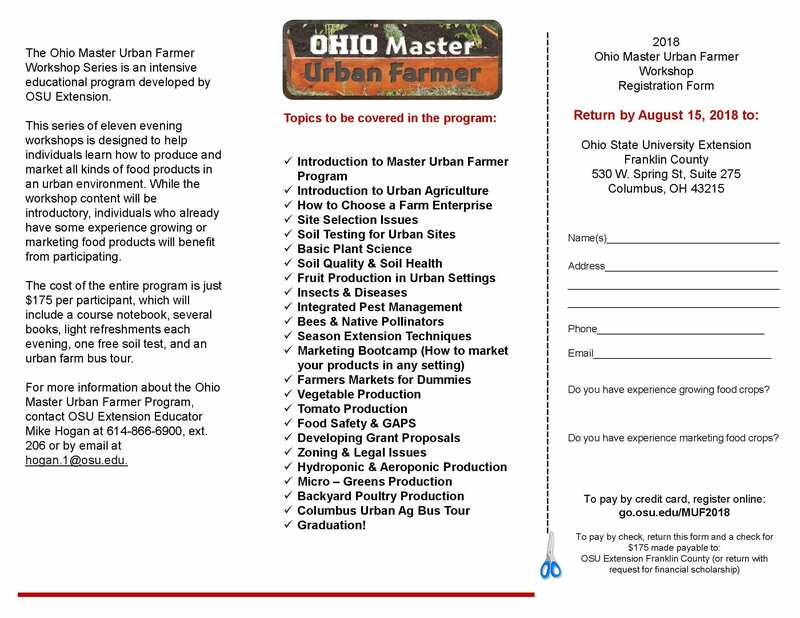 Registration is now open for the 2018 Master Urban Farmer Workshop Series. This 11 week course is designed to help individuals learn how to produce and market all kinds of food products in an urban environment, so that they can develop urban farms or food based businesses. A complete list of course topics is listed on the brochure at this link. Registration is required by August 15, although the class typically sells out before the registration deadline. 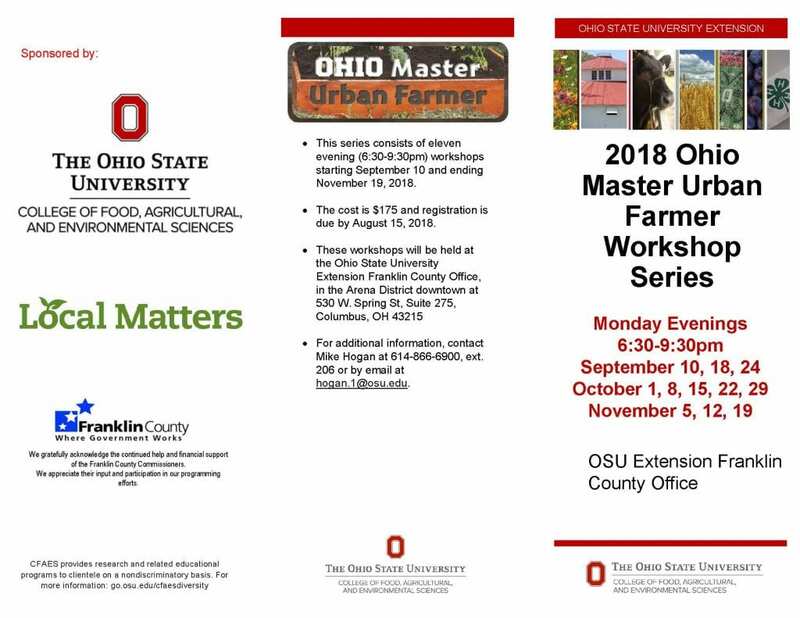 To register, go to: go.osu.edu/MUF2018. It can be an unusual concept for the backyard grower, community gardener and urban farmer to think about as we have barely started harvest of fresh tomatoes, but now is the time to start planning and planting for production in late summer, through fall and into a winter harvest. Basil – Start from seed under the lights or by direct seeding into the garden. 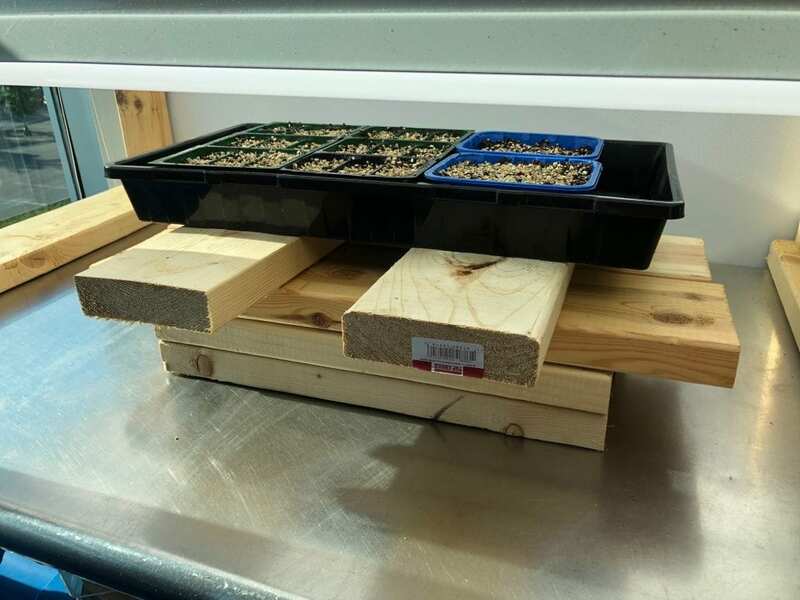 This will provide the grower with a stream of fresh, tender leaves to use or preserve. 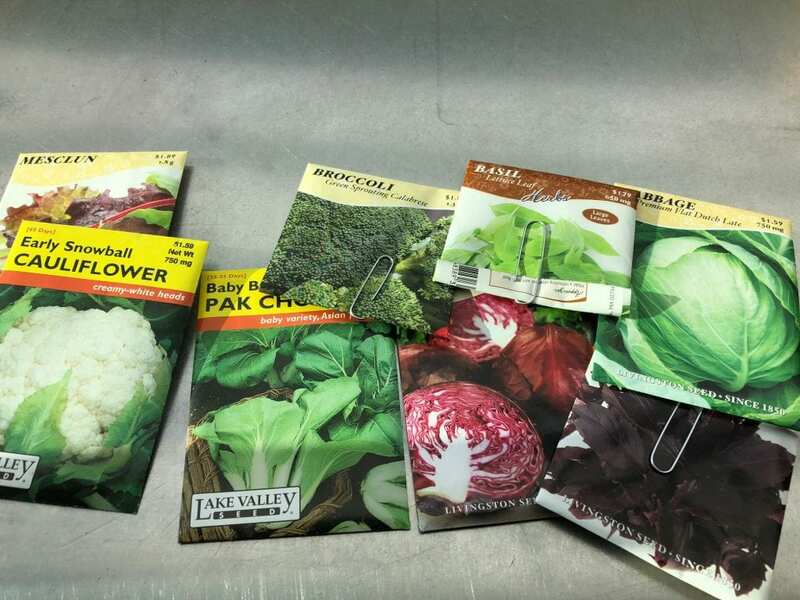 Brassicas – cabbage, broccoli, cauliflower and asian cabbages can be started now under the lights. Transplant into cell packs after about two weeks in the flats. 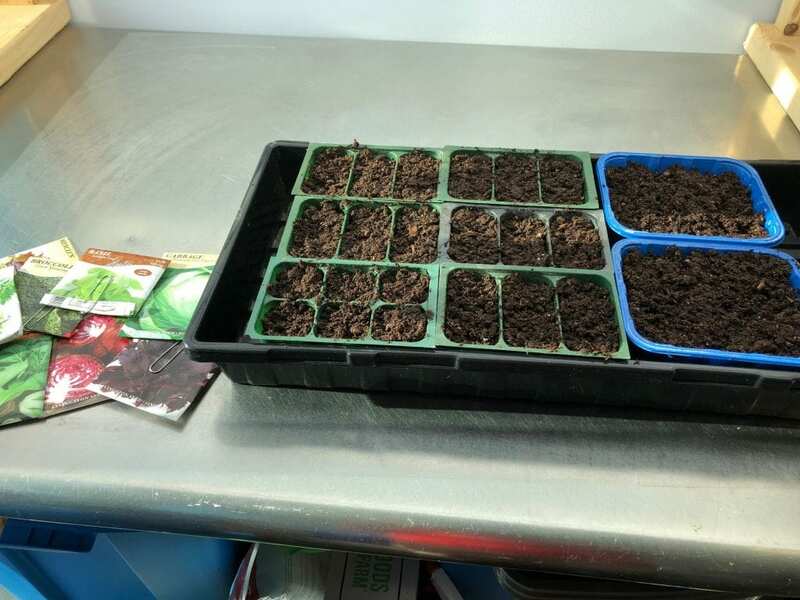 They will be ready to transplant into the garden in 6-8 weeks. Lettuce – small amount now, start more every two weeks until October. 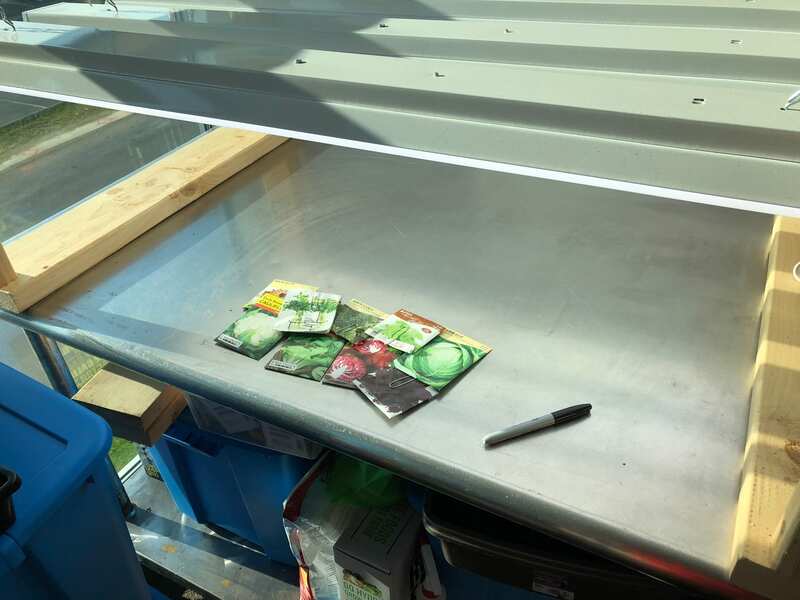 The seed start grow station had been taken offline for a period of three weeks after spring vegetable production. This was done to sterilize the area and break the life cycle of any pests present. A small amount of lettuce will be started now. This lettuce has a good chance to mature in hot weather. The chance for cooler temperatures in late summer plus the use of shade cloth will attempt to control bitterness or bolting to seed. There is a good chance of failure to mature an edible product so only a small amount of starts will be attempted now. More will be started with an every two week timeline. Potato – a second crop of potato can be started now if you have a plot that has not come off Solanaceae Family in the last three years so that a later harvest is possible, but does not affect good crop rotation. Lettuce – can be planted on two week rotations until September 1st – 15th. Ohio is a true four season growing environment. Some of the above may need season extension in order to survive. We will keep a close watch on the ENSO predictions. Make sure that you observe crop rotation of families as best as possible. One of the most common problems encountered by the backyard grower, community gardener and urban farmer is how to effectively deal with weeds in the growing space. Weeds propagate in two general ways, either through vegetative growth such as rhizomes and lateral root growth or through the production of seeds. There are several ways of controlling weeds available to the grower including herbicides, mowing, mulching, cover crops and tillage. Understanding weed life cycles is critical in the fight for weed control. A combination of methods using Integrated Pest Management strategies has the greatest chance for success. Weed numbers can reach severe levels when control measures are not implemented. Noted in this picture are cocklebur, thistle, morning glory, smartweed, pigweed, comfrey, lambs quarters and bindweed. A seedbed was produced by mowing and then tillage of the residue into the soil after a few days of decomposition. Cereal rye (Secale cereal) was chosen due to its ability to rapidly germinate and tolerate occasional mowing. 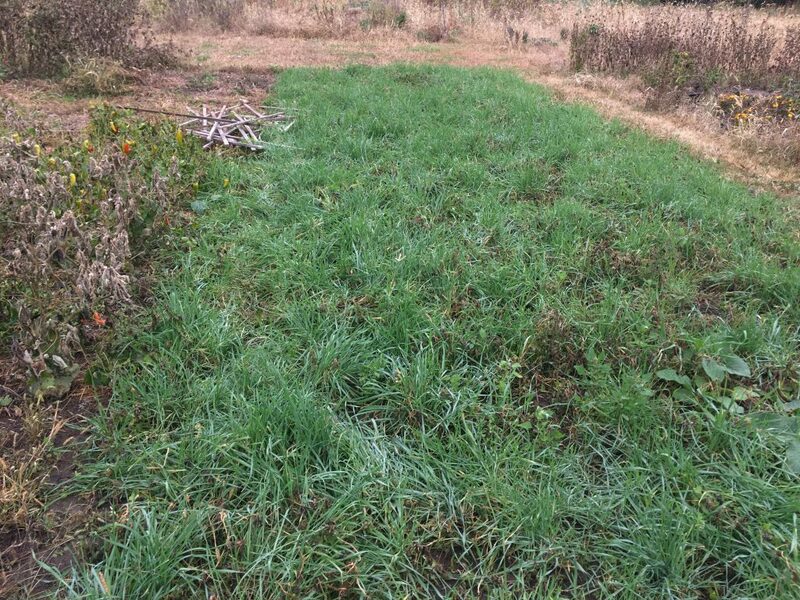 While normally used as an over-wintered cover crop, it is ideal for this usage as it allows germination of weed seed and will regrow after several mowing passes allowing larger numbers of annual weeds to be eliminated. The seed bank for weeds in this community garden plot is vast. Quick germination of many species of weeds including pigweed and smartweed were noted among the rye. Mowing is one of the easiest and most effective strategies for weed control. When an annual weed is mown as it matures but prior to setting seed, that plant has been killed. When a perennial is mowed prior to seed set the plant is weakened and valuable root reserves must be used to produce new top growth. 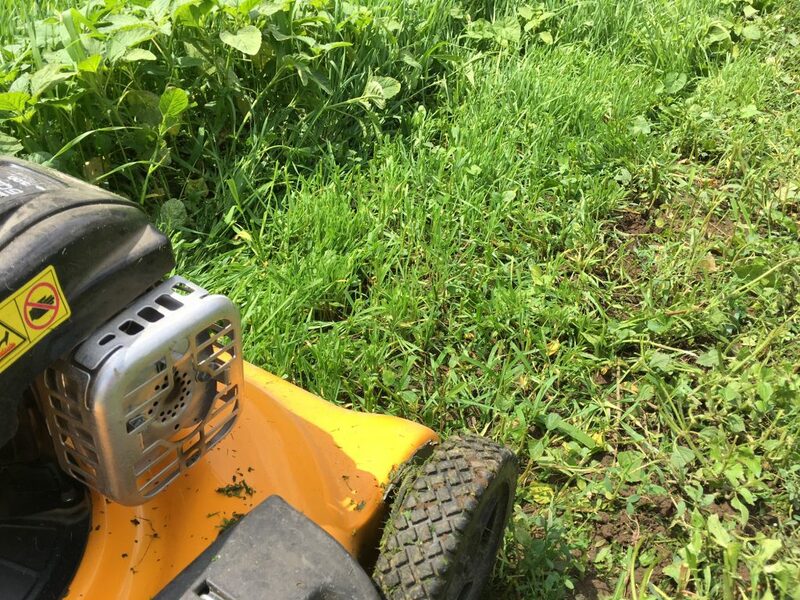 Passes with a lawn mower were made when the growth reached about 12 – 16″ tall, but before any weeds were allowed to go to seed. A mulching mower was used to keep the organic matter present in the plot. 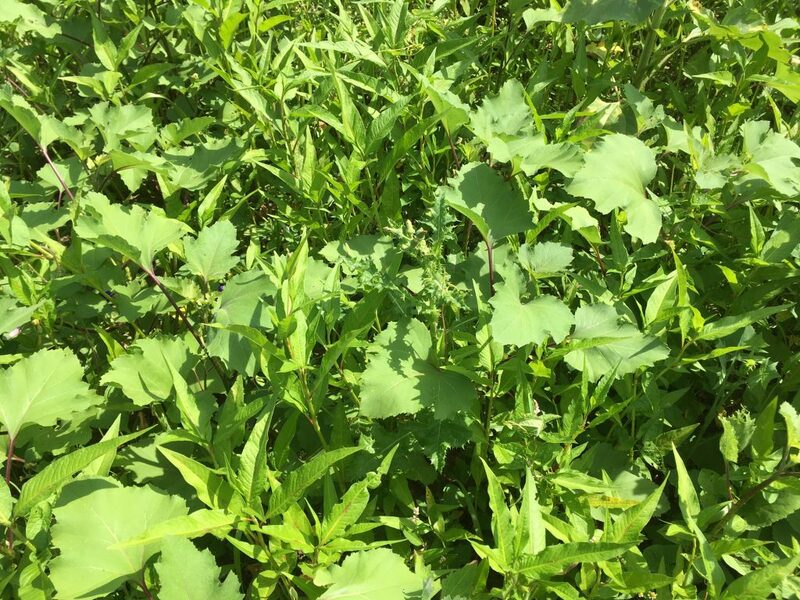 Weeds can bring large amounts of nutrients from the subsoil and their organic matter should be kept in the soil profile unless they are invasive root fragments or have gone to seed. After several mowing passes a large amount of annual weeds were removed from the weed seed bank. While some perennial weeds remain, the repeated mowing has weakened the plants allowing for easier control via herbicide if desired. The winter rye being cold hardy will be able to persist over the winter. 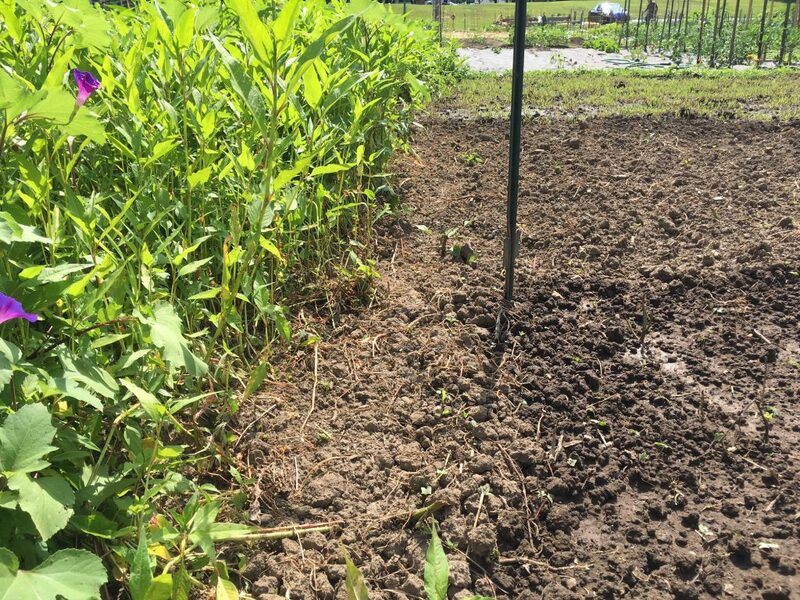 It will control erosion and use its profuse root system to hold on to the nitrogen and other nutrients that were scavenged by the weeds and mulched as green manure from mowing during the season. Rye also has the effect of suppressing weeds allelopathically similar to a natural herbicide and has noted effects on both dandelions and canada thistle, two very common and difficult weeds to control in vegetable gardens. 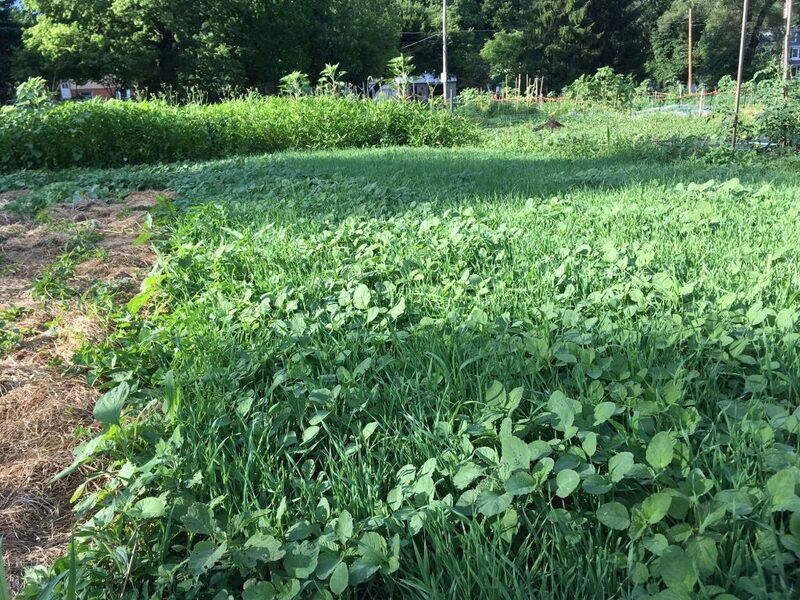 With or without a cover crop added, mowing is a simple and effective strategy to assist in control of weeds for the backyard grower, community gardener or urban farmer. It will kill annual weeds and weaken perennial weeds and prevents them from adding more weed seed into the soil seed bank.